European Space Agency (ESA) astronaut Samantha Cristoforetti holds up a bag of dehydrated strawberries in this screenshot from a video ESA posted on April 21, 2015. When it comes to preparing for a long-duration space trip, forget the Tang; what you really need are some wholesome snacks. 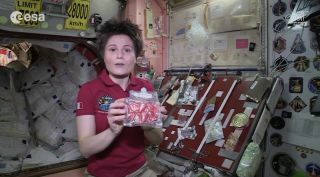 Aspiring astronauts got a glimpse of spaceflyers' snack options when Italian astronaut Samantha Cristoforetti showed off her favorite space snacks in a video recorded on the International Space Station and released the European Space Agency on April 21. "Snack time is a great opportunity to put the right kind of rocket fuel in your body," Cristoforetti, the first Italian woman to fly in space, said in the video. "And, as always, don't panic — eating healthy is not rocket science." All of these snacks have a long shelf life, which makes sense because astronauts don't have access to refrigeration on board the orbiting lab, and the spaceflyers routinely go months between cargo shipments. Lastly, Cristoforetti displayed a "very special power bar" made just for her. It includes "plenty of healthy nutritious ingredients" such as nuts, seeds, full-grain cereals and the cyanobacterium spirulina. Cristoforetti arrived at the International Space Station in November. She and fellow Expedition 43 crewmembers Anton Shkaplerov and Terry Virts are scheduled to come back to Earth Wednesday (May 13).